^ Davies, P.C.W. Thermodynamics of Black Holes (PDF). Reports on Progress in Physics. 1978, 41: 1313–1355 [2011-02-10]. doi:10.1088/0034-4885/41/8/004. （原始内容 (PDF)存档于2013-05-10）. ^ 撰文／麥森（John Matson）翻譯／宋宜真. 霍金是對的. 科學人雜誌. 2011-01-01 [2013年8月25日] （中文（台灣）‎）. ^ 6.0 6.1 吳俊輝. 黑洞好黑！. 科學人雜誌. 2012-03-01 [2013年8月25日] （中文（台灣）‎）. ^ 傅學海,蔡文祥 合著. 《認識天文》. 國立空中大學. 2001年: 150. ISBN 9576614465 （中文（台灣）‎）. ^ 「黑洞」不存在 只有「灰洞」？霍金再次震驚全球科學界. Yahoo奇摩新聞《福斯新聞網》(Fox News) （中文（台灣）‎）. ^ Event Horizon Telescope. eventhorizontelescope.org. [2019-04-10] （英语）. ^ 澎湃新闻. 黑洞照片将在全球六地同步发布，来看上海名列其中的原因. 搜狐. 2019-04-10. ^ 12.0 12.1 12.2 12.3 12.4 作者：蘇宜. 《宇宙掠影-天文學概要》. 麗文文化. 2007年5月1日: 205. ISBN 9789577482884. （原始内容存档于2016年3月4日） （中文（台灣）‎）. ^ 科學日報. 神秘壯觀美麗，圍繞黑洞的吸積盤. 中評網. 2008-07-26 （中文（中国大陆）‎）. 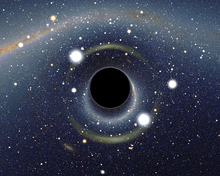 ^ Hawking: There may be a way out of black holes. Aljazeera. 26 August 2015. ^ Rincon, Paul. Hawking: Black holes store information. BBC News. BBC. 26 August 2015. ^ CNN, Ashley Strickland. This is the first photo of a black hole. CNN. [2019-04-11]. ^ 20.0 20.1 20.2 20.3 史蒂芬霍金（著）；许明贤、吴忠超（译）. 《时间简史》（插图版）：第六章—黑洞. 湖南长沙: 湖南科学技术出版社. ISBN 978-7-5357-3230-9. ^ Bombaci, I. The maximum mass of a neutron star. Astronomy and Astrophysics. 1996, 305: 871–877. ^ Darling, David "Lense-Thiring Effect"
^ Vesperini, E.; McMillan, S. L. W.; D'Ercole, A.; 等. Intermediate-Mass Black Holes in Early Globular Clusters. The Astrophysical Journal Letters. 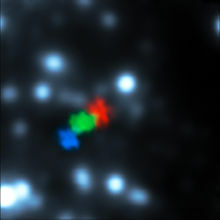 2010, 713 (1): L41–L44. Bibcode:2010ApJ...713L..41V. arXiv:1003.3470. doi:10.1088/2041-8205/713/1/L41. ^ 30.0 30.1 B.J. Carr and S.B. Giddings, "Quantum black holes,"Scientific American 292N5 (2005) 30. ^ Giddings, S. B. & Thomas, S. D. High-energy colliders as black hole factories: The End of short distance physics. Phys. Rev. D. 2002, 65 (5): 056010. Bibcode:2002PhRvD..65e6010G. arXiv:hep-ph/0106219. doi:10.1103/PhysRevD.65.056010. ^ znithy. 原初黑洞与大爆炸之前的黑洞. Stop.Doubting.Me. 2011-05-05 [2013年8月25日]. （原始内容存档于2012年9月15日） （中文（中国大陆）‎）. ^ Ripped Apart by a Black Hole. ESO Press Release. [19 July 2013]. ^ Black Holes | Science Mission Directorate. NASA. [17 March 2018].